The Black & Decker CHV1410 dust buster boasts modern lithium battery technology, strong suction and long lasting power. 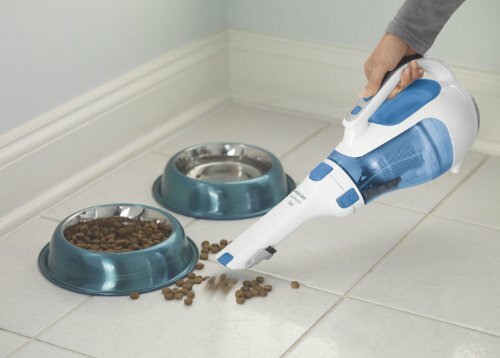 No bag is needed because this portable vacuum comes with a translucent dirt canister, making it easy to see how much is sucked up so it can easily be emptied when full. 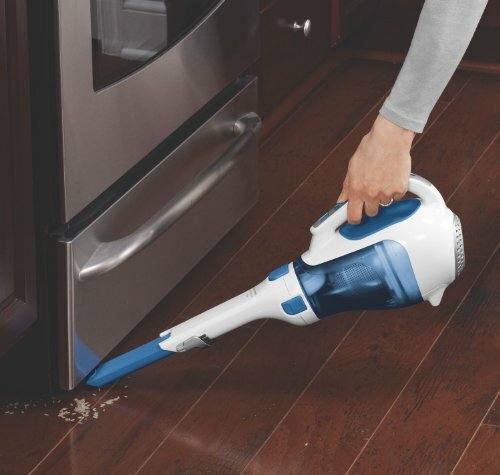 Always on call, this hand vacuum stays charged for up to 18 months even when not cradled in the charger, and is lightweight enough to tackle all kinds of quick clean ups around the house. The high efficiency lithium ion charger that comes with the chv1410 dust buster helps to protect the Black & Decker hand vacuum by automatically shutting off when the battery is fully charged, allowing for the convenience of storing this Black & Decker on the charger while still having the option of long running times, year after year. Black & Decker has been setting the standard for the innovation and design of power tools, accessories, yard and lawn equipment, home cleaning products, hardware and other home improvement products since 1910. Black & Decker has grown from a small machine shop in Baltimore to a global manufacturing and marketing giant with a wide line of top quality products for use in and around the home. When someone needs to get work done, they count on Black & Decker to supply the products that will do the job most reliably and efficiently. This hand vacuum includes an innovative, lightweight shape, which allows users to take advantage of the spinning slim nosed design that is combined with a built-in extension crevice feature. The slim nose allows for a 50 percent greater reach than older Black & Decker models, ideal for those tight spots and hard-to-reach places. With a wider mouth design, the chv1410 scoops up larger pieces of trash. Then, the user just needs to flip up the brush to clean upholstery. Lithium ion batteries give the dust buster strong suction and fade-free power whenever they are used. Other, older types of batteries tend to fade and lose suction, making it hard for users to finish their cleaning before they run out of power. Instead, users can now have the assurance that they can finish tasks efficiently, quickly, and conveniently with Black & Decker chv1410 dust buster. While not expecting a lot out of the Black & Decker chv1410 dust buster, in reality it performs almost as well as most uprights. With high energy and long lasting power, the narrow opening on the front end of it concentrates the power to provide maximum vacuum suction. The cyclonic action keeps spinning dust and debris away from the filter which helps to keep the suction action strong. It delivers powerful suction where users need it most. A small green piece on the end pulls out to help extend the hand held vacuum to allow users to get into hard to reach places all over the house. It works amazingly for getting dust out from under the sofa, dressers, and other furniture, pick up dirt between the stove and counter, or cobwebs in the corners of rooms and behind the draperies. When the job is a sofa covered with pet hair, the crevice tool has a small brush attachment for it. And while the brush wasn’t all that helpful, the crevice tool itself worked well enough to remove the animal hair. The brush for the crevice tool may be helpful for cleaning ceiling fans, although this is just an idea so far, since it allows for pressing down on the crevice tool without pressing into the blade. Other than that, the brush is not very useful. It has a long lasting battery with quick recharge and can be left in the charger so it’s always fully charged. The dust bowl and filters are easily emptied and cleaned. Because of the clear plastic covering, the dust bowl is visible. The accessories, an extending nozzle, flip-up brush, and rotating nozzle, all work exactly as they are supposed to. The brush for the crevice tool didn’t work well but Black & Decker has made an excellent hand-held vacuum.